Galway Film Centre will welcome legendary Hollywood Cinematographer Nick McLean to Galway for two special events on March 9th. 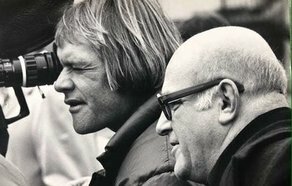 Nick McLean has worked on some of the most revered films of the 70s, 80s, and right up to his contemporary work, as well as his working relationships with directors such as Robert Altman, Steven Spielberg, George Lucas, Hal Ashby, Clint Eastwood, Burt Reynolds, Mel Brooks, Richard Donner, and many more. Nick was one of the most acclaimed cameramen of the last 50 years, having been one of the architects of the influential visual style of the New Hollywood movement of 1970s US Cinema, then shooting of the biggest blockbusters of the 1980s (The Cannonball Run, City Heat, Short Circuit, The Goonies, etc) and then becoming of the most celebrated cinematographers in US television of the 90s and 2000s (he shot the award-winning likes of Evening Shade, Cybill, and Friends). Join Nick for an intimate audience wherein he’ll share an account of his career, personal anecdotes about Hollywood in the 1970s and 1980s, and what it was like to work on one of the most successful TV shows of all time. This masterclass will last 90mins – 2hrs in duration and will have limited tickets. Come join GFC as we excitedly sit down to watch one of the most famous and beloved cult classic kid’s movies, ‘The Goonies’ on Saturday March 9th at 7pm in Pálás. The screening will be followed by a Q&A with Cinematographer Nick McLean.